I’m beginning to think Mae Murray has returned from the dead and is haunting me. I have just completed a full length biography of this fascinating actress, Mae Murray: Portrait of a Silent Film Diva. It’s due out in 2012 by The University of Kentucky Press. I’ve spent most of this weekend entering the edits of one of the manuscript’s readers. An arduous process, but it is part of the fine-tuning necessary in birthing a new book. Many years ago, I remember reading DeWitt Bodeen’s excellent career article on Mae in Films in Review. 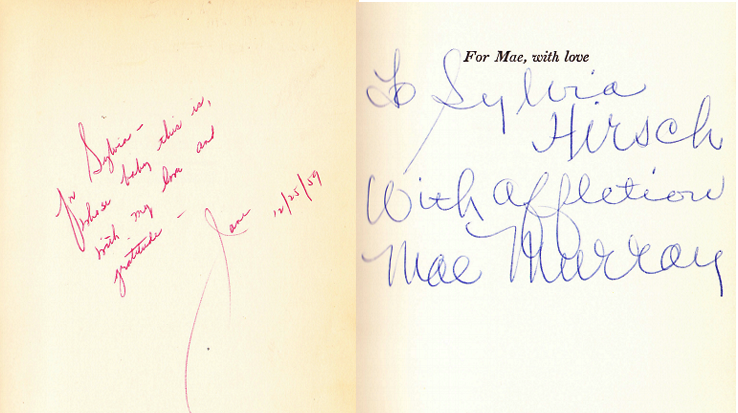 He mentioned Mae’s 1959 biography by Jane Ardmore. Mae had a phobia when it came to discussing her childhood and origins. So when the book was released, she was highly offended that Ardmore had published her real name as being Marie Adrienne Koenig. Bodeen wrote that Mae went to bookstores around Hollywood and, with pen in hand, crossed through any mention of Marie Adrienne Koenig. It looked something like this: Marie Adrienne Koenig. 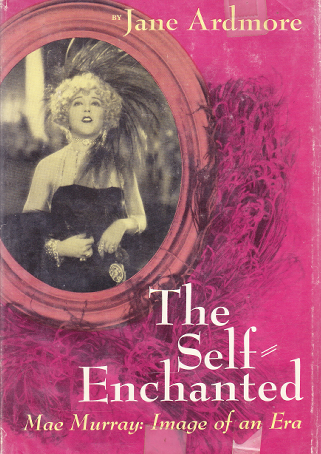 I was a little skeptical, until I came into possession of Sylvia Hirsch’s copy of The Self-Enchanted. She was Mae’s representative at the William Morris Agency. Hirsch was instrumental in landing the contract for the book. 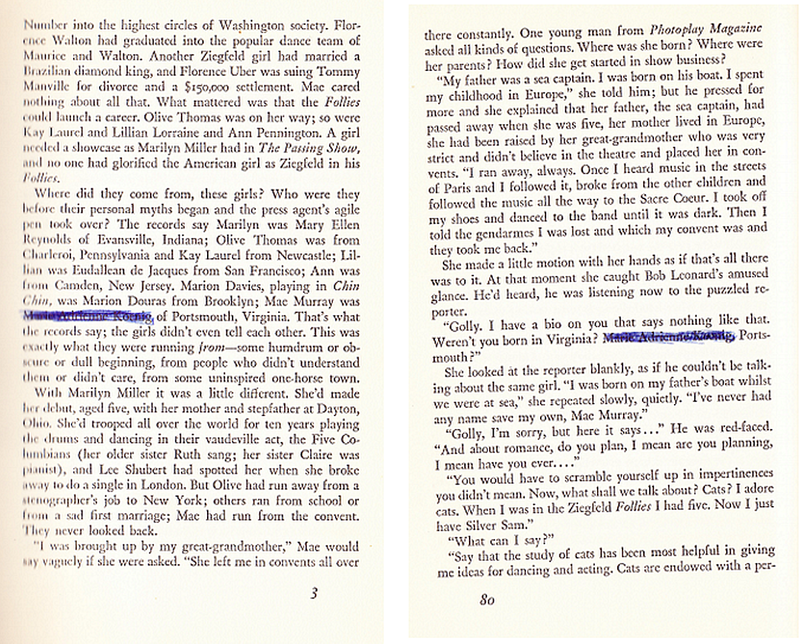 Sure enough, Mae took the blue ballpoint pen she used to inscribe the book and crossed through Ardmore’s mention of Marie Adrienne Koenig. While it looked rather silly, Mae was onto something. Marie Adrienne Koenig was not her real name. Well, not exactly. But, that’s one of the interesting tidbits of my upcoming biography of this unforgettable character who has invaded my life and who has made no indication she is moving on.